Our boat is an inflatable special made for diving 8m boat, its name is Aqua Dancer. It takes up to 12 divers with 24 tanks and can travel with a speed up to 35 knots. The engine is a diesel Yanmar 240 HP, silent and emission free. There is a wide platform just 20 cm over water on the stern with a big ladder for easy entry and exit. The boat is equipped with all the needed equipment for safety and convenience, included 1st aid kit with oxygen. The boat is special made for our rough seas and the most of dive sites are no longer than 10 minutes from our dock. We always have on boat fresh water, refreshments and snacks. 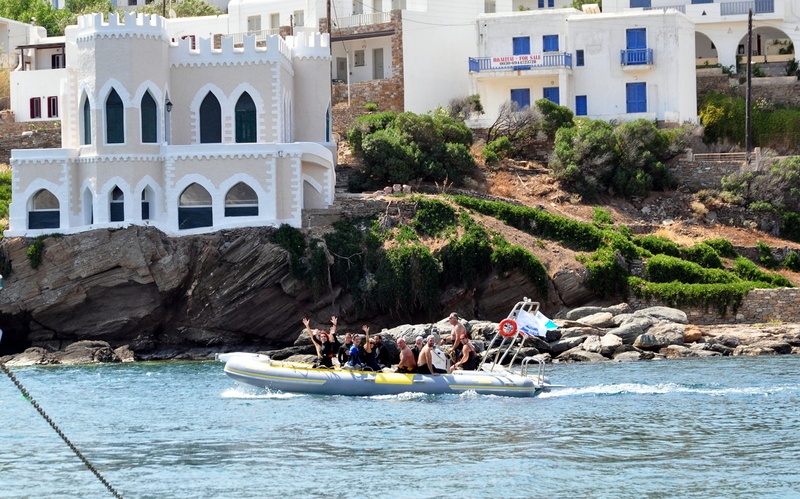 Our boat departs from Loutra Dock just 100 meters from our shop and entry and exit is very easy in it. All dives non decompresion dives, Dive time is the total submersed time.